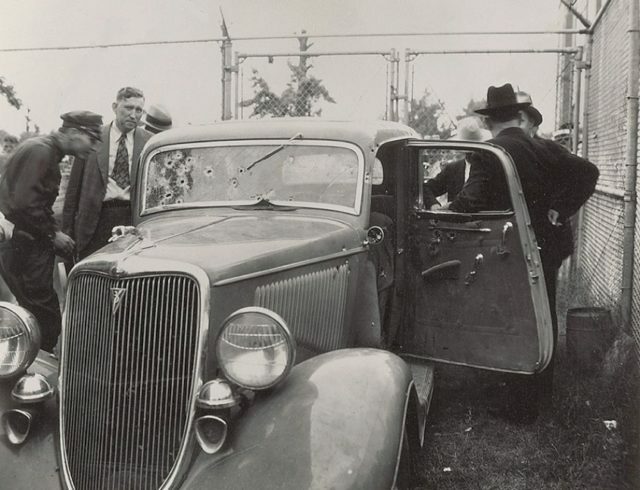 In the book, Ambush, Ted Hinton recalled what he saw when Clyde Champion Barrow and Bonnie Parker were shot and killed outside Sailes, Bienville Parish, Louisiana when they were ambushed by police. “I see her falling out of the open door, a beautiful and petite young girl who is soft and warm, with hair carefully fixed, and I smell a light perfume against the burned-cordite smell of gunpowder, the sweet and unreal smell of blood,” Hinton recollected. The famous couple met their fate on May 23, 1934, as the grand conclusion of one of the most spectacular manhunts in history. SITTING: Bob Alcorn, Henderson Jordan and Frank Hamer. Barrow was a suspect in multiple killings, and he was wanted on charges of murder and robbery as well as state charges for kidnapping. Clyde met Bonnie Parker in January 1930 in Texas. When they met, Bonnie was 19 and married, but her husband was in prison after a murder conviction. Clyde, who was 21, wasn’t married. However, soon after meeting Bonnie, he was sent to jail for burglary. 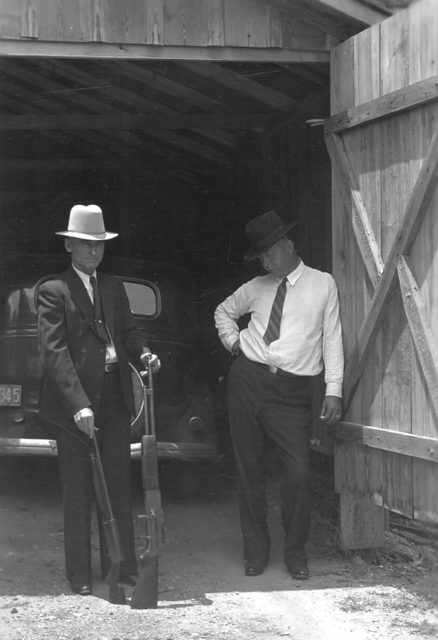 Using a gun Bonnie smuggled to him, Clyde escaped. He was later recaptured and returned to prison. Paroled in February 1932, he resumed his relationship with Bonnie, and they headed out to live a life of crime. The couple were wanted for auto theft, and by the time of their deaths they were believed to have committed several burglaries and robberies as well as 13 murders. Barrow was suspected of killing two policemen in Joplin, Missouri, and of kidnapping a couple in rural Louisiana then releasing them in Waldo, Texas. There were several sightings that followed, which linked this pair with multiple bank robberies and auto thefts. 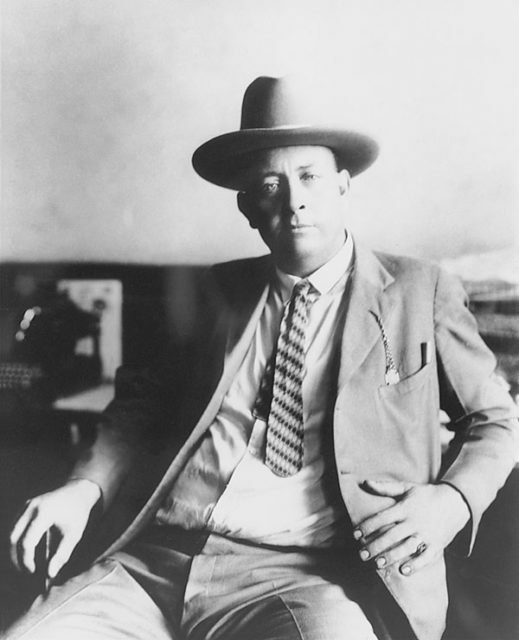 He was said to have murdered a man in Hillsboro, Texas; murdered a sheriff and wounded a second in Stringtown, Oklahoma; kidnapped a deputy in Carlsbad, New Mexico; robbed businesses in Dallas and Lufkin, Texas; stole a car in Victoria, Texas; tried to kill a deputy in Wharton, Texas; robbed and murdered in Abilene and Sherman, Texas; killed a man in Dallas, Texas; abducted the chief of police and a sheriff in Wellington, Texas; and committed murders in Columbia and Joplin, Missouri. 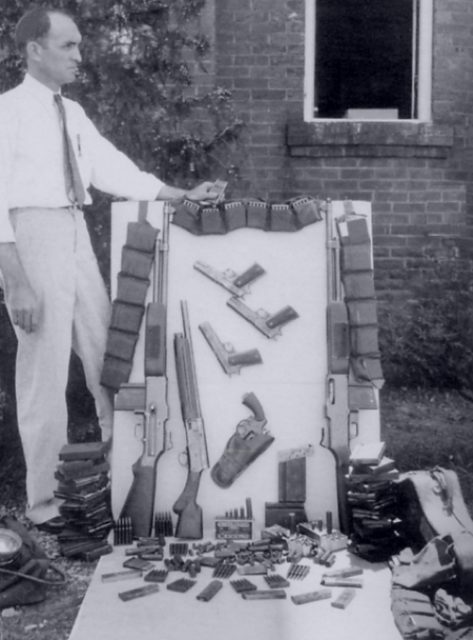 Over a dozen guns and several thousand rounds of ammunition (including 100 20-round BAR magazines) were in the perforated Ford. 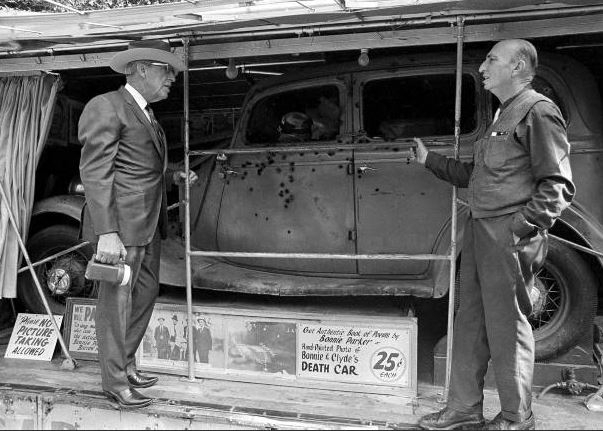 On a rural road in Bienville Parish, Louisiana, Bonnie and Clyde were ambushed by police officers on May 23, 1934. The couple were out during daylight and shot by four Texas officers, B.M. 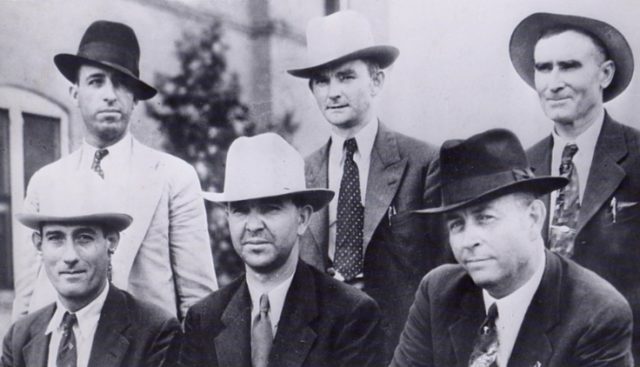 “Manny” Gault, Ted Hinton, Bob Alcorn, and Frank Hamer, and two Texas officers, Prentiss Morel Oakley and Henderson Jordan. With the approval of Governor Ferguson, Hamer was persuaded to accept the job to hunt down the Barrow Gang. According to Hamer’s account, he was commissioned as a Texas Highway Patrol officer and then seconded into the state prison system as a special investigator who was placed in charge of finding Barrow and his gang. Hamer accepted the assignment but complained about the salary being only $180 per month, which was half the price of his regular pay. It was emphasized that Hamer would collect his fare percentage of the reward money and would be allowed to take what he wanted from the Barrow Gang’s possessions when they were caught. Set to do the job, Hamer examined Barrow’s movement pattern to learn he made a wide circle through the Midwest and skirting state borders along the way so he could take advantage of state line dictums. Former Texas Ranger who “got” Bonnie & Clyde. He found that the Barrow circle had its anchors in Dallas, Texas; Joplin, Missouri, and northwest Louisiana with some wider arcs that permitted bank robberies. The next couple of months were busy with banks in Poteau, Oklahoma; Lancaster, Texas; and Stuart, Everly, Rembrandt, and Knierim, Iowa all being robbed by the gang, which included Henry Methvin, an Eastham escapee who had become Clyde’s protégé. Four posse members from Texas were in Shreveport, La., when they learned that Bonnie and Clyde were heading with Methvin to Bienville Parish that evening. Barrow had designated Methvin’s parents’ home as a rendezvous in the event they became separated, and Methvin did separate from the couple in Shreveport. The full posse set up an ambush along Louisiana State Highway 154 just south of Gibsland, near Sailes. Hinton’s recount had the group in place by 9 p.m. on the 21st and said they waited throughout the entire day on the 22nd with no sign of Bonnie and Clyde. Other accounts say they set up the evening of the 22nd. It was about 9:15 a.m. on May 23 when the officers, who were hidden in the bushes and almost ready to give up, heard the stolen Ford V8 driven by Barrow approaching at high speed. The official report filed by the posse had Barrow stopping to speak with Methvin’s father, who had been planted there earlier that morning with his truck to be a distraction to Barrow and to force him into the other lane and closer to the posse. The lawmen then opened fire to release about 130 rounds. Probably before given any order to do so, Oakley fired first, hitting Barrow in the head and killing him instantly. Hinton reported that he heard Bonnie screaming as she realized Clyde was dead and before they opened fire on her. The officers then emptied all their arms firing at the car. Just one of the many wounds suffered by the couple would have proven fatal. 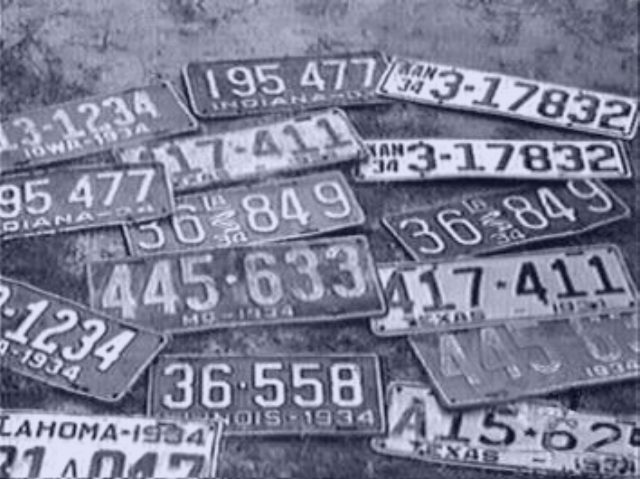 According to researchers, Bonnie and Clyde were shot more than 50 times each, but others said it was more like 25 per corpse for a total of 50. In Dr. J.L. Wade’s 1934 report, he listed 17 entrance wounds on Clyde’s body and 26 on Bonnie’s. Wade was the parish coroner. The report indicated several headshots on each, including one that had completely snapped Clyde’s spinal column. The undertaker, C.F. “Boots” Bailey, indicated he had a difficult time embalming the two bodies because of all the bullet holes in them. The officers were temporarily deafened from all the gun fire. They inspected Clyde’s Ford and found an arsenal of weapons, including sawed-off semi-automatic shotguns, stolen semi-automatic rifles, assorted handguns, several thousands of rounds of ammunition, and 15 sets of license plates for various states. News about the ambush traveled quickly after the officers drove into town to call their bosses. The ambush site ended up the place for a crowd gathering, and the two officers who were left to guard the bodies lost control of the crowd. In the melee of the crowd, one woman cut off bloody locks of Bonnie’s hair as well as pieces of her dress that were later sold as souvenirs. When Hinton returned, he found a man trying to cut off Clyde’s trigger finger and became sickened by what he saw. The coroner said when he arrived on the scene he saw people collecting souvenirs, such as bloody pieces of the couple’s clothing, shell casings, glass slivers from car windows, and more. He said even one man had an open pocket knife and had reached into the car in an attempt to cut off Clyde’s left ear. The coroner had Hamer get people away from the car and take control of the circus that had formed. The Ford car, along with the two bodies, was towed to Conger Furniture Store and Funeral Parlor, which was in downtown Arcadia. Bailey did the preliminary embalming in a small preparation room in the back of the store. The town’s population was estimated to have grown from 2,000 people to 12,000 people within 24 hours. People arrived by plane, horseback, buggy, and plane. The price of beer rose from 15 cents to 25 cents per bottle and ham sandwiches quickly sold out. Henry Barrow identified his son’s body then sat in a rocking chair in the furniture section to weep. H.D. Darby, who was a young undertaker in Ruston at the McClure Funeral Parlor and Sophia Stone, a home demonstration agent from Ruston, came to identify the bodies as well. They had been kidnapped by the gang on April 27, 1933, in Ruston and were later released near Waldo, Arkansas. Parker supposedly laughed when she discovered Darby was an undertaker and she said maybe one day he would work on her dead body. Darby helped Bailey with the embalming process.